In May this year, a concert was organised in Amsterdam on the occasion of Rabindranath Tagore’s birth anniversary. The event was organised by a Surinamese family of Indian descent and showcased some brilliant performances by Bengali dancers and singers settled in Europe. While most of the performances of Tagore’s songs were in Bengali, the anchoring was conducted in Dutch which made sense as the audience were primarily Dutch speakers. The entire event ran smoothly until the end when Pratima Singh was invited on the podium to say a few words. Singh is the founder and convener of the Netherlands chapter of an organisation called the Overseas Friends of Bharatiya Janata Party (OFBJP) and she delivered her speech in Hindi. Neither the culture of Bengal nor that of the Netherlands has anything to do with Hindi. A similar incident happened during the Durga Pujo organised by the Bengali diasporia of Amsterdam in 2017 when the organisers flew in a BJP leader from Mumbai. He also delivered his speech in Hindi. Interestingly, on both occasions the pro-BJP members were greeted with loud applause and protest or resistance against the politicisation of cultural festivals was absent. The BJP’s growing popularity among the Indian diaspora of continental Europe is a recent trend. The Non-Resident Indians (NRIs) consider the Indian Prime Minister as a flag-bearer of development and as a mascot of anti-corruption. They admit that they have no interest in the politics of BJP and nor do they favour Hindu nationalism but they appreciate the Prime Minister’s efforts in bringing “Acche din”. Needless to say, this unquestioned support for Modi translates itself into support for organisations like the OFBJP, and, ultimately, becomes a tool to channel the patriotism buried in the hearts of Indians residing outside India. Interestingly, the majority of the supporters of the Indian right in the west are engineers and management staff working in high-profile corporate jobs. Hence they are part of the neoliberal economic machinery. A crowd of BJP supporters at a rally in India. Photo credit: Narendra Mod, Flickr, CC BY-SA 2.0. The Overseas Friends of the Bharatiya Janata Party (OFBJP) is a support system in western countries for the ruling party in India. Although it initially started in the USA and the UK , it claims to have branches in over 40 countries. In the same breath they proclaim that the “(l)arge section of Indian Diaspora across the globe has been traditionally a big supporter and sympathiser of Bharatiya Janata Party (BJP).” It is true that the support for the BJP in North America is not new. The Hindu nationalist party and its sister organisations have been working in the USA for last two decades. Although the OFBJP have thrived in the USA and the UK over the last two decades, their growing support base in continental Europe seems a recent development. If one were to google “OFBJP Europe”, one would find a Facebook page of the same title opened in 2014 for the general election campaigns and the page currently has more than 1200 followers. 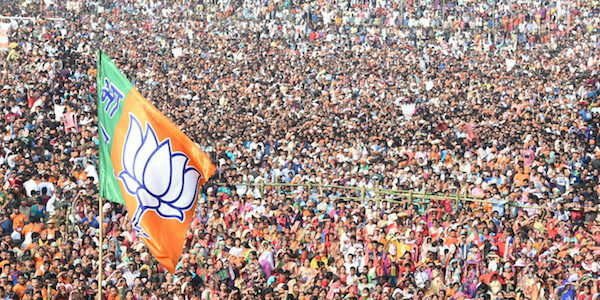 Further internet research revealed that OFBJP has relatively strong organisational set-ups in the Netherlands, Germany, France, Denmark, Sweden and Norway among others. The formation of the national sections of the OFBJP across continental Europe may be a recent development but they gradually started recruiting members and supporters at a rapid pace. The recruits came from rich businessmen to upper-middle-class NRIs. While the supporters could be from any region of India, the office-bearers are mostly from northern or western Indian states: Gujarat, Rajasthan and Maharashtra. Needless to say, almost all the supporters and members have a Hindu background. The trend discussed above demonstrates how Indian right’s global political network is dominating the Indian diaspora in the west. The cultural events are being politicised and, on many occasions, the singing of the national anthem is a symbolic gesture to express patriotism in the west. The bottom line is that features of Hindu nationalism are strengthening its roots among the Indians working in European private sectors. The sector which is least influenced by the Indian right is that of humanities and social sciences academia, but, unfortunately these are a small minority. Nevertheless, if the microscopic minority organises themselves and develop a counter-narrative then it may give rise to an alternative voice of India in the West. Keeping in mind the general elections in 2019, it is high time to reorganise the secular and rational forces among the Indians in the western world. An alternative network is the need of the hour. This article was originally published on the Asia Research Institute blog, Asia Dialogue and has been republished with permission. Mriganka Mukhopadhyay is a historian of religion. He is currently working on his PhD project on Theosophy in India at the University of Amsterdam.